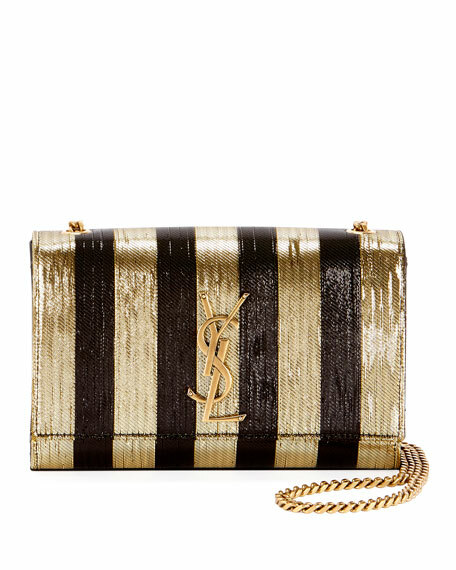 Saint Laurent crossbody bag in metallic striped fabric and leather. 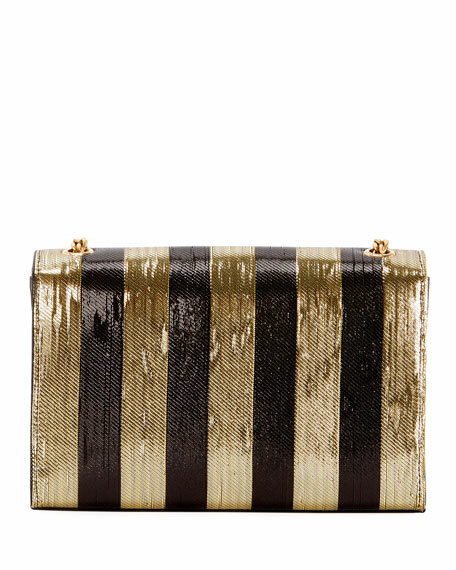 Eric Javits "Bali" crossbody bag in signature Squishee?? material? ?man-made fibers that are woven to resemble raffia but are more lightweight, flexible, and durable. Finished with leather trim and pompom/tassel ornament. Adjustable leather crossbody strap. Zip top. Inside, fabric lining; three pockets. Approx. 9" round. Imported. Liberty London coated canvas phone bag with leather trim. Logo-embossed and embroidered butterfly at front. Adjustable shoulder strap, 45" drop. Liberty London coated canvas phone bag with leather trim. Logo-embossed and embroidered butterfly at front. Adjustable shoulder strap, 45" drop. Open top; divided compartments. 6.7"H x 3"W x 3.9"D. "Iphis" is imported. Maison Alma woven straw top handle bag with parrot and leaf brocade trim. Wrapped top handle with hanging tassel charms. Maison Alma woven straw top handle bag with parrot and leaf brocade trim. Wrapped top handle with hanging tassel charms. Removable brocade shoulder strap. Open top. 11.4"H x 11.8"W x 7.1"D. Made in Colombia.